If you’re looking for a romantic castle in Germany, you don’t have to look very far. The country is covered in a plethora of charming castles, filled with romantic stories and myths. Some might not look as romantic as others, as they were built inside for defensive purposes, but what’s to stop a girl from daydreaming? Even though Burg Hohenzollern isn’t as luxurious as a palace, it’s still one of the prettiest castles in Germany! Love Castles? PIN IT FOR LATER!! Perched high upon the top of a mountain in the Schwäbisch Alb, built for strategic defense against intruders, sits the Burg Hohenzollern. Built first as a fortress in the 11th century, it has been destroyed and fallen into ruins only to be rebuilt a third time, in it’s current form. 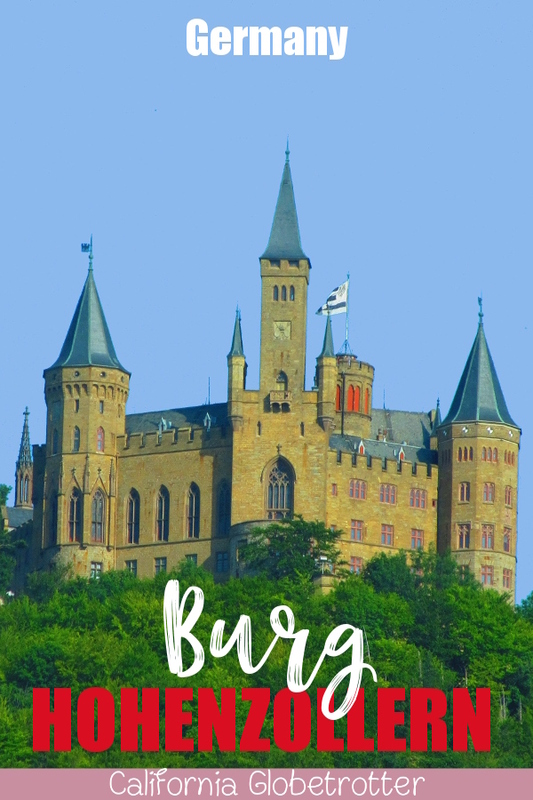 The difference between a Burg and a Schloss is that a Burg is built for protection against invaders while normally a castle is built for comfort and beauty, such as the case of a 10-month siege by the free imperial cities of Swabia in 1423. The first castle built here was possibly known as the “Crown of all Castles of Swabia” and was known to be the “most fortified house in all Germany”. The second castle to be built here was extended and even more fortified than the first. Eventually it served as a refuge for those seeking shelter within during the Thirty Years War. Falling into ruins over time, it would later be rebuilt a third time as a family memorial for Hohenzollern by King Frederick William IV of Prussia. He had been traveling to Italy and wished to stop and learn about his family history by climbing Mount Hohenzollern. He designed the castle based on castles from the Loire Valley in France that now stands as one of Germany’s most visited romantic castles with up to 300,000 visitors per year. Eventually, over time, this fortified residence would eventually turn into a castle with works of art throughout the castle. Today, the castle is still privately owned by the Brandenburg-Prussian family line and one of the best castles to visit in Southern Germany! You can only partially drive up Mount Hohenzollern until you come to a parking lot. Here you must pay €2 for parking before catching a shuttle bus up the rest of the mountain. There is a small store at the back of the parking lot where you need to buy your tickets into the castle before going up! Then you pay the shuttle bus separately €3.10 for there and back. I had previously been to this castle when I studied abroad in 2007. We had decided to take a day trip by train into the town of Hechingen before taking a shuttle bus up the mountain. We did not plan very well and didn’t even bother to look at weather conditions. It was a blistery, blizzard like conditions up at the top of the castle. Winds were strong that could knock you over and the snow on the fence was frozen backwards. While it was cool to see the castle covered in snow, there wasn’t much we could see because of the dense fog. While recently on Instagram, I saw another blogger’s picture and remembered that I had gone and would love to see it again. So, sporadically, Hans and I decided to take a day trip road trip Ulm before continuing on to Burg Hohenzollern. This time, the weather was incredibly hot! 99*F and rising! However, we had clear blue skies and could see the surrounding villages below the castle. I even discovered that during the warmer months, there is a biergarten at the castle as a place to relax for those visiting the castle or for those hiking up the mountain! The only way to visit the inside of the castle is to take one of the free guided tours, either in English or in German. We happened to go on one of the special days where the castle was open to visitors without a guide. We were able to just walk around the castle, however, we paid the same price €12 per person to walk around the castle without a guide as we would have with a guide. Luckily, the guides were still walking around the castle to give you tidbits of information as you walked around. One interesting fact was that the castle was too cold to live in during the winter months because it couldn’t be properly heated. Therefore, the castle was never actually used as a royal residence but more a vacation home. Inside the castle, you are not permitted to take photographs and are required to wear big special slippers, one size fits all! It was like skating around the castle in slippers, as they were far too big for me to actually pick up my feet. Inside you will see the Blue Room which was decorated by the Queen and even has a portrait painted of Queen Victoria of England as a widow above the desk. Further around the castle, you can see a large collection of Medieval armory on display as well as some fine china! You can check out two of the churches up at the castle, one that dates back to the first fortress to be built here as well as climb up one of the towers which houses an exhibition of photographs of the castle. You can also walk around the entire castle, getting great views of the surrounding villages and the many different look out points. 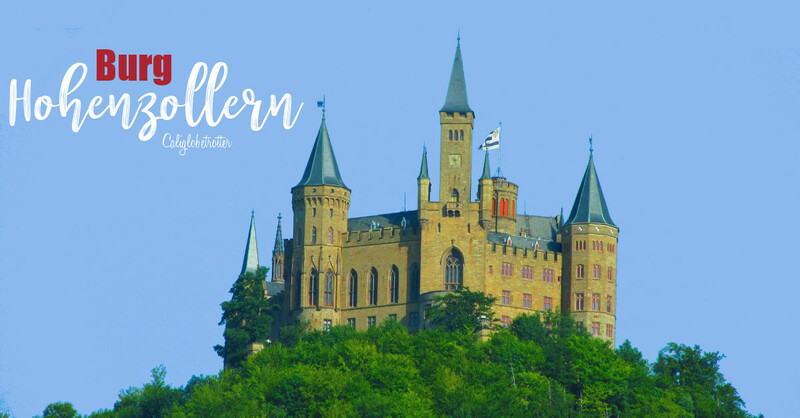 Overall, if you’re looking for an easy day trip from Frankfurt or a quick trip from Stuttgart, you will love visiting Burg Hohenzollern! It’s a great family-friendly castle for the kiddies to visit and see some of the armory. If you’re interested in visiting Germany and are looking for more information, I highly recommend using the DK Eyewitness Travel Guide! Without these guides, I would be lost! This is my travel Bible! Love German Castles? Here are more! Liked this Post? PIN IT FOR LATER! 4 bloggers like this on caliglobetrotter.wordpress.com! Wow, what amazing places to explore! Very cool!